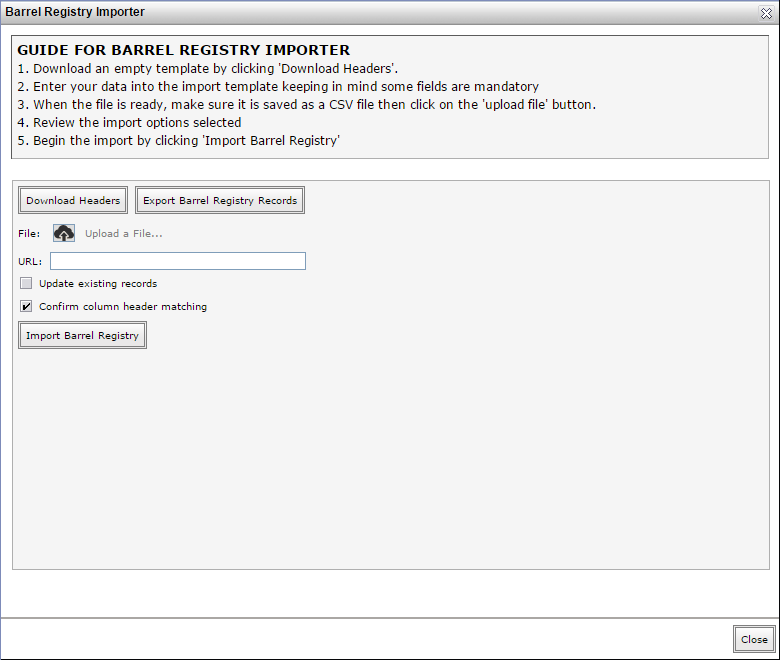 Import/Export tools available to you under Winery Setup can save time when needing to input large numbers of records. For example, if you had a large number of new barrels to import, navigate to Winery Setup > Vessels > Barrels. You must have the “local vintrace admin” rights to do import/exports. If you do not have this permission, Import/Export will be grayed out. Ask your local vintace admin to assist you with the project (create the import file and use it to perform the import. Depending on your company, your local admin may grant you temporary permission. Follow the on-screen instructions. You have the option to download the headers or alternatively export the existing records (if you wish to make bulk changes to existing data). When you have made all your changes or created new records, you must save the file as CSV (comma delimited) before attempting to upload. This means that color, formulas, filters, etc, will be lost. You are welcome to delete any unneeded columns or rows. To update records, you must keep the column with the VINx2 ID. There is a one thousand item limit on imports to reduce the system resources needed for the operation. If you have more than one thousand items (not including the header row), create separate files for items 1001-2000, 2001-3000, etc and import them sequentially. The system will guide you through the import to ensure all mandatory fields are satisfied, the appropriate fields are mapped and there are no missing dependencies. By selecting Update existing records the system assumes you have exported existing records and want to make changes to those upon import rather than creating new entries. By selecting Confirm column header matching you have the opportunity to adjust the default column header matching (if importing from a third party system). Exporting the registry/records for a given element is an all-or-nothing proposition; no filters may be applied. However, the downloadable CSV file can be used to manipulate the data using Excel or some other third-party application. 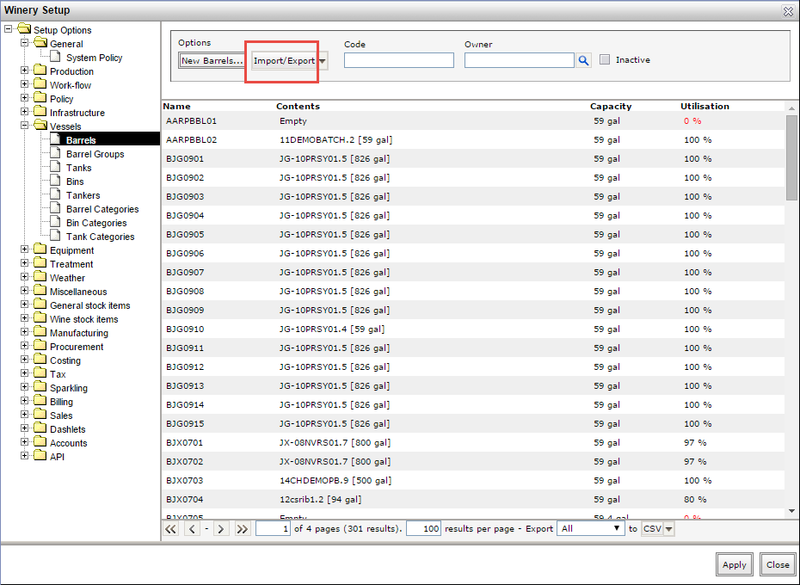 Import/Export is an option available for a wide variety of elements. Head into Winery setup and open various elements - if you see Import/Export, then the service is available for that element. If you are just getting started with vintrace, refer to our Implementation guide.